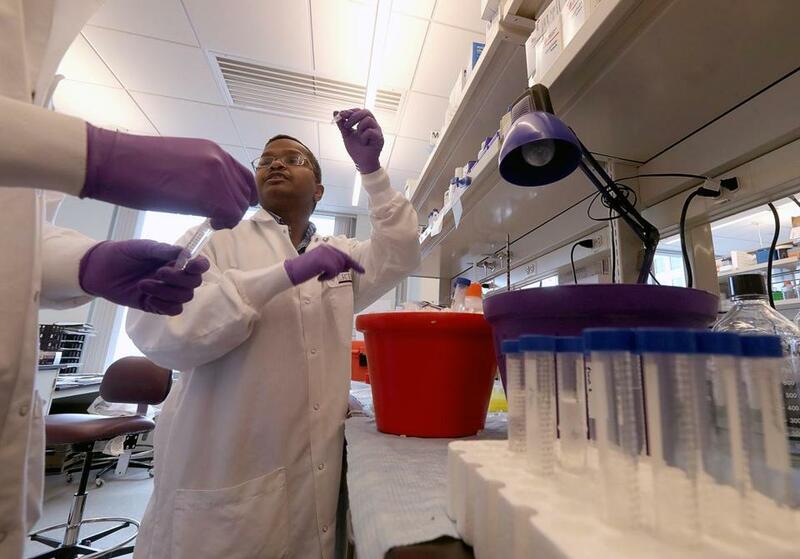 A scientist in a lab at Vertex Pharmaceuticals Inc. in May. Vertex Pharmaceuticals Inc. on Tuesday released clinical findings showing its new approach to combating cystic fibrosis substantially improved lung function in patients, lifting hopes for a treatment that could be used by about 68,000 people worldwide — including 24,000 who don’t respond to any existing medicines. The results prompted Boston-based Vertex to say it plans to launch one or two late-stage clinical trials of the biotech’s three-drug combination in the first half of next year. In a trio of early- and mid-stage studies, Vertex tested its “triple combo” medicine in about 100 patients who had the hardest to treat mutations. The findings for a critical gauge of how much air a patient can exhale in one second were far better than many scientists expected. Vertex, which has about 1,400 employees in Massachusetts and 2,100 globally, has developed the only drugs that treat the underlying genetic cause of cystic fibrosis. The inherited disease causes mucus to block the passage of air to the lungs. About half of those born with the disease don’t live for more than 38 years, according to the Cystic Fibrosis Foundation. Chief executive Jeffrey Leiden said the company’s latest breakthrough came from an insight made in its labs about three or four years ago — it decided to use three drugs in combination, instead of two, to treat the toughest cases of cystic fibrosis. Data from the clinical studies confirmed lab research suggesting the three compounds together could bind to misfolded mutant proteins and fold them correctly so they can move to the surface of cells, allowing those cells to function properly. Among those heartened by Tuesday’s clinical findings was Bob Coughlin, president of the Massachusetts Biotechnology Council, whose 15-year-old son Bobby could eventually take a Vertex triple-combo drug to treat his cystic fibrosis. Vertex has two FDA-approved drugs on the market, Kalydeco and Orkambi, that treat patients with different cystic fibrosis-causing genetic defects. About 30,000 patients globally are eligible to take those drugs, less than 40 percent of all cystic fibrosis patients. The company tested three separate triple combo drugs in the recent trials. Each consisted of Kalydeco, a compound called tezacaftor that is known as a corrector because it repairs malfunctioning proteins, and one of several other correctors Vertex is testing to determine which would be most effective. All of the combination drug candidates showed “meaningful clinical benefits” and were “generally well tolerated” by patients, Vertex chief medical officer Jeffrey Chodakewitz told stock analysts in a conference call. Between 5 and 10 percent of the estimated 75,000 people worldwide with cystic fibrosis don’t produce enough protein to be eligible for the any of the triple-combo candidates. For those patients, Vertex is working with Cambridge collaborators Crispr Therapeutics Inc. and Moderna Pharmaceuticals Inc. on other approaches, such as gene therapies. “One of the messages we have for the CF community is we’re not stopping till we get something for everyone,” Leiden said.